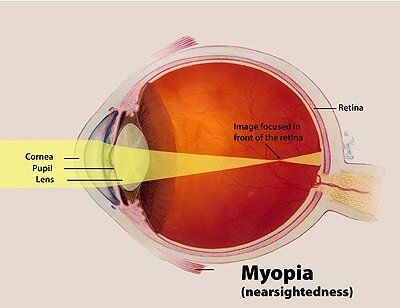 What is myopia?Myopia, also known as nearsightedness, is a common type of refractive error where close objects appear clearly, but distant objects appear blurry. How common is myopia? Based on a study published in 2008 (link is external), experts at NIH estimate that at least 33 percent of Americans are nearsighted. According to a 2009 study (link is external), the number of Americans with myopia has increased significantly from the 1970s to the early 2000s. The prevalence of myopia has also been increasing in many other countries around the world. It is particularly prominent among school-aged children living in urban areas in some Asian countries. In the past, people thought children might become myopic from spending too much time reading and writing, which require close-up vision, or from reading in poorly lit rooms. Recent studies (link is external) suggest that the increase of myopia in children could be related to a decrease in the amount of time they spend outdoors. What kinds of treatments are available for myopia? The most common way to treat myopia is to prescribe eyeglasses or contact lenses. Refractive surgery, once the eyes have stopped growing, has become another option for many people. To find out the amount of myopia you have, an eye care professional uses a device called a phoropter to place a series of lenses in front of your eyes until you are seeing clearly. The combination of the results from both eyes is written as a prescription that will correct your vision to make it as normal as possible. Eyeglasses use curved lenses to refocus light rays onto the retina, instead of in front of it. Contact lenses correct vision in the same way as eyeglasses, except they rest directly on the eye. Refractive surgery changes the shape of the cornea to correct myopia. There are different types of refractive surgery, but the most common are LASIK and PRK. LASIK removes tissue from the inner layers of the cornea. To do this, a section of the outer corneal surface is cut and folded back to expose the inner cornea. A laser removes a precise amount of tissue to reshape the cornea and then the flap of outer tissue is placed back in position to heal. The correction possible with LASIK is limited by the amount of corneal tissue that can be safely removed. PRK removes a thin layer of tissue from the surface of the cornea to change its shape. This allows light to focus more accurately on the retina. Like LASIK surgery, with PRK there is a limit to how much tissue can safely be removed and the amount of nearsightedness that can be corrected. Many people will experience dry eye symptoms after refractive surgery and a small number may develop chronic dry eye syndrome. Some people may also develop vision symptoms such as double vision/ghosting, starbursts, glare, and halos, especially at night. Ask your eye doctor to discuss with you the risks and benefits of LASIK or PRK surgery before you undergo either procedure. Phakic intraocular lenses (IOLs) are a new option for people who are very nearsighted or whose corneas are too thin to allow the use of laser procedures such as LASIK and PRK. Phakic lenses are surgically placed inside the eye. What is high myopia?High myopia is a severe form of myopia in which the eyeball continues to grow and becomes very long from front to back. It can increase the risk for retinal detachment, early development of cataracts and glaucoma. What is degenerative myopia?Degenerative myopia (also called pathological or malignant myopia) is a rare and mostly inherited type of myopia that begins in early childhood. In degenerative myopia, the eyeball elongates rapidly and causes severe myopia, usually by the teenage or early adult years. Degenerative myopia may also progress far into the adult years. People with the condition have a significantly increased risk of retinal detachment and other degenerative changes in the back of the eye, including choroid neovascularization (abnormal blood vessel growth), and glaucoma.